I have such a tasty, easy recipe to share today. It is one that my friend, Debbie, from Mountain Breaths shared with me. Debbie and I, although we have never met in person, have been such good friends for several years. We share with each other, and even text each other. Debbie is such a positive, kind soul, and a blessing in my life. She shared this recipe with me when I was caring for my late beloved mom, after she had fallen back in January of 2018. My mom and sister loved this recipe when I fixed it for them, and it's so nice because it's made in the slow cooker. Serve it with some pasta on the side and a salad and you'll be set. The chef napkin is made from a tea towel, which I cut in half. It's perfect for an Italian dinner. I love this recipe because it's made in the slow cooker! Don't we love recipes that are made hours ahead, and then dinner is ready? Beat egg, salt and pepper together. Dip chicken into egg and coat with breadcrumbs. Saute' chicken in butter in a skillet. Arrange the chicken breasts in the slow cooker. Pour pizza sauce over chicken and cover. Layer mozzarella cheese over the top and sprinkle with Parmesan. Cook an additional 15 minutes. this looks and sounds amazing! I haven't made this dish before but have ordered it while dining out. I would love to try making it! Your table is set perfectly for your Italian meal! Looks like a restaurant! Hope you are well....doing some catch up today! Have a nice week Kitty! This would be one of my favorite dishes to order at a restaurant! I should try to make it! Thanks! Such a classic! I am vegetarian, but we enjoy eggplant Parmigiana regularly in our home. Delicious. What a delicious looking dish! I love using my slow cooker. Arriving home to dinner already made is a great thing. Have a wonderful day, Kitty. YUM! And this looks so easy! YES....YES....YES...I love my slow cooker and use it most often on the days that I work outside the home. And I do love me some chicken parm. YEP...this is a must try. Thanks for sharing the recipe dear Kitty. Hugs and blessings to you dear friend. I'm loving the Italian vibes of this week's yummy dinner! This sounds delicious and a must try for sure. I like using the crock pot but I tire if it easily, seems like most meals taste the same after awhile. The convenience of a crock pot is great though. I LOVE Chicken Parmesan! I make mine similar to this, only I don't put it in the slow cooker. I like it to stay crusty. Thank you so much for sharing, sweet friend. Hugs and blessings to you! Thanks for the recipe. Your presentation is so nice. Yum! Anything in a slow cooker is a good idea and this really looks good! Now that my appetite is coming back, your post has actually made me hungry for some of this! :D HUGS! Hi Kitty, how nice to have received this recipe from your blog friend and that you two have become close friends! This is one of the things that I like when you make a connection you make with a blogger. 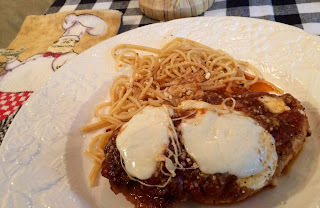 This recipe looks so good and easy to make while making the pasta on the side and the salad. Thanks for sharing a C&C with J&J. Enjoy the week. I really need to explore more slow cooker recipes for over the summer months when it’s just too doggone hot to flip that stove on. This is going in the hopper! I hope you are well, sweet friend. Thinking of you! And sending lots of love your way! Kitty, I love chicken parm, and that looks sooo good. It's never occurred to me to make it in the slow cooker. Must try it! Oh Pasta . . . how I miss thee! Well I have it once in awhile but not as much. This looks like something from a fancy restaurant! YUM!!! 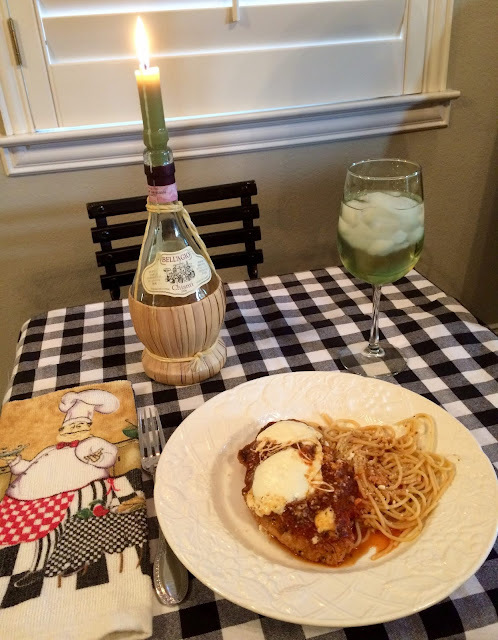 We love this dish too and yours looks great!What a charming table!Hugs! Yum! Yum! Yum! This is one of my favorite dishes! Believe it or not, I have never made this myself. I would have used marinara sauce, it would not have occurred to me to use pizza sauce, but I like that idea. I am going to try this at some point this month. It looks delicious. Thanks for sharing. Your Chicken Parmigiana looks delicious, we would really enjoy it! Thanks so much for sharing with us at Full Plate Thursday and hope you are have a great week!